Valjean Society CEO, Michael Harris, met with Maricopa County Sheriff, Paul Penzone while attending the 2017 Martin Luther King, Jr. March at Burton Barr Library on January 16, 2017. Sheriff Penzone took the stage to introduce himself to a culturally diverse audience and did so in an impressive manner. 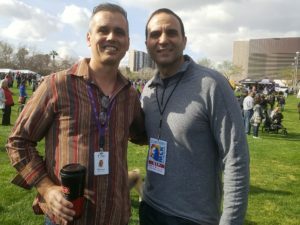 Following Sheriff Penzone’s speech, Michael sought to introduce himself to Sheriff Penzone. Expecting an “Arpaio Era” plainclothes security detail, Michael scanned the area for a safe way to approach Sheriff Penzone. Amazingly, the new Sheriff simply emerged from an opening in the fence and walked, unescorted, into the MLK March crowd to meet with Maricopa County citizens. If ever there existed an opportunity for MCSO to bridge the divide between community and law enforcement, the time is now and Sheriff Penzone is the man for the job! !